Paula Abdul is a rare superstar. Despite her remarkable career, immense talents and global popularity, she is as accessible as she is iconic, as sweet in person as she is on TV and as authentic as she is extraordinary. So, it’s no surprise that her fans are ecstatic to see her first solo tour in 25 years. It’s been 30 years since her first mega-hit, seven-time platinum album Forever Your Girl captured us, with singles such as "Straight Up," "Forever Your Girl," "Cold Hearted" and "Opposites Attract.” But Paula was no stranger to the entertainment industry before becoming a mega-star. Her mother was a concert pianist and she studied ballet and jazz at a young age. While in college, she was a Los Angeles Lakers cheerleader, which led her to be discovered by The Jacksons. She was signed to do the choreography for the video to their 1984 single "Torture" and eventually several videos for Janet Jackson and various other artists. How does it feel to be touring again? Right now, I’m just trying to put the last-minute touches and tweaks on the show. I’m at a dance studio rehearsing with the dancers. I really enjoyed touring last year with New Kids on the Block and Boyz II Men, so I thought it was time to do a show and reconnect with my fans. Your extraordinary career includes two multi-platinum albums, six #1 singles, two Grammy Awards, five MTV Awards, four American Music Awards, two Emmy Awards, two People’s Choice Awards, a Teen Choice Award and two Kid’s Choice Awards. Is there less pressure on you now as a performer or more so because of your iconic status? I think the pressure is more from me to do a great show. You know, most of the dancers are almost half my age, so I have to be in top shape. What made you decide to do this tour? It was time to go back on the stage and do what I love. At the height of my career, I had to disappear for seven years to recover from a plane crash. I was touring and it was toward the end of my tour, we were leaving St. Louis to go to Denver on a 7-seater private plane. I wasn’t wearing my seat-belt and we crash-landed, and part of the plane went up in flames. I sustained multiple injuries and had to have many surgeries and rehab. So, I spent seven years getting better. Then this show came along, American Idol. In fact, I had one of my surgeries while judging on American Idol. Millions have been your fans since the beginning of your career and whole new younger generations love you from American Idol, too. Did you have to focus on a particular demographic when planning your show? When I was recording and doing shows, I had a very diverse demographic fan base. Then I had that accident and disappeared for seven years. Thanks to American Idol, I got a whole new wave of young fans, so it’s cyclical. What can audiences expect to see in the show? Any surprises? They get to see a great show, have fun and a good time. I do a mix of retro stuff that people like but also new material too. They are great! I am so grateful and lucky to have people who have been with me throughout my career, so I wanted to do this show and connect with them again. I love my fans! I would be remiss if I didn’t ask you about your gay fans. I wouldn’t have my career if it wasn’t for my gay fans. I have always been very close to the community, as a dancer, a choreographer and musician. They have been there with me through thick and thin and stayed with me, always loyal. I love the gay community! Do you miss American Idol? American Idol was a great experience, even with the dysfunctional family that we were. I had a great time with Simon Cowell, Randy Jackson and all the talented people that came through the show. You know, I never had a big brother, so I learned a lot from Simon. He taught me how to go deeper and be strong. I was always strong, but he helped me a lot. In fact, we had a mini reunion not long ago at Simon’s house. Should we look forward to a new album in the near future? I’m waiting to see the response to this tour and how things turn out, so maybe. I’m starting to work on a few things. I have a huge fear of elevators. I think because I was stuck in one with my mother when I was a little girl. What happens is that I start laughing uncontrollably and have to face the wall. One time, I was overseas and staying at this hotel. Even though I had asked to be on one of the lower floors, they put me on the 33rd floor. I got into the elevator with my assistant and started laughing. All of sudden, a heard a voice say, “Paula?” I turned around and it was my dad! There we were, half way around the world, at the same hotel and at the same time! 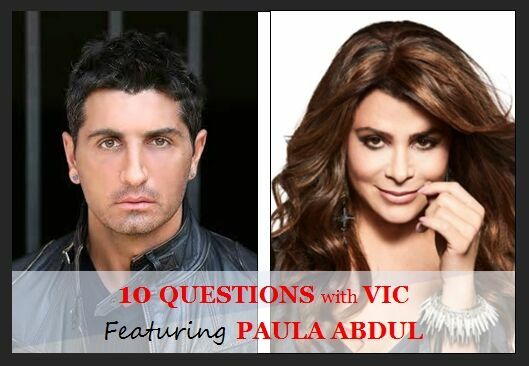 For more information about the Straight Up Paula tour, including tickets, visit www.tour.paulaabdul.com.